As always, I had an amazing five days of meeting people, seeing friends, buying yarn, etc. Mango Moon had a contest this year. 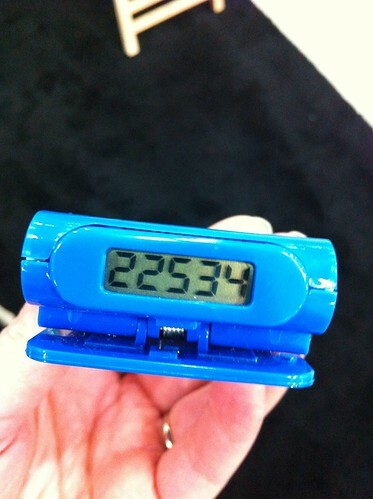 They gave out 100 pedometers and offered a prize to the person who logged the most steps during the show. I wasn't concerned about winning but we really curious to see just how much walking I did during the show. 22534 steps. That's from 10 AM on Saturday until about 1 PM on Monday. That's about 12 miles, I think. Oh, and I won. By 5000 steps. I really do get around. I can't share photos of what I saw but I will tell you what I thought was great in no particular order. The Sincere Sheep. My favorite vendor from the last Sock Summit, Sincere Sheep offers interesting and unusual base yarns naturally dyed in gorgeous colors. Sweet Georgia. I've been reading Felicia's blog for years. I remember someone bringing a skein of her yarn to Purlygirls maybe 6 years ago and coveting it. Her bases look luscious, her colors are deep and vibrant, and her booth display was top-notch. There was so much more but those are a few off the top of my head!